Anarky kidnaps a legal munitions dealer, and accuses him of selling mines that have killed innocents. Anarky’s accusations are broadcast over a pirated TV signal. 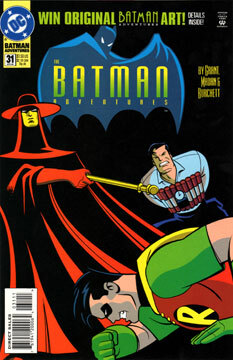 Robin tracks him down and rescues the arms dealer, but the “bomb” merely releases a banner that reads “weapons kill.” Later, Bruce Wayne attends a charity event. Anarky strikes here next, and captures Bruce and several other wealthy Gothamites. He accuses the wealthy men of grave crimes against humanity, except Wayne. Anarky says Wayne must pay for the company he keeps. While Wayne tries to convince Anarky otherwise, Robin is on his way, desperate to arrive before new bombs go off. Meanwhile, the whole thing is being televised again. Robin arrives and draws Anarky away. Bruce slips his bonds, and attempts to dispose of the bombs, but they go off. Robin and Anarky chase and fight, trading philosophical barbs, until Robin knocks Anarky unconscious. When Robin checks on Bruce, he finds the “bomb” only released paint. While Anarky had committed crimes, murder was not one of them. And Robin conceded that some of Anarky’s rantings had a point. I felt this tale was very mediocre. It was a solid narrative foundation, but just didn’t go very far. It wasn’t bad, just not the best. Dev Madan and Rick Burchett are up to bat again. The art is adequate, but sadly not near the home run of issue #29. Anarky would be a fun custom to make. In fact, I made one many years ago based on this issue. With luck, it will never be seen by human eyes again!